Part three of a three-part series this week details how municipalities are feeling the pain of textile waste. In a multipart series this week, Waste360 will examine the problem of textile waste and how some companies and municipalities are working to develop effective and efficient recycling and waste reduction efforts. To read part one, click here. To read part two, click here. Collection and disposal costs for wasted textiles are projected to hit $4 billion by the end of 2018 and $4.5 billion in 2020, nationwide, if current waste generation and recycling rates remain unchanged. This hit is felt by many, especially local governments. By 2020, New York City will likely pay $100 million to deal with these materials, a trend that extends beyond that city, says Anne Johnson, vice president of Resource Recycling Systems (RRS), a materials management consulting firm. Still, few jurisdictions are targeting textiles. Those working on it are in early stages and up against big challenges: limited to no collections infrastructure, no scalable sorting and processing systems and far less domestic outlets than they need, even for quality materials with value, which is a bulk of them. Raleigh, N.C., contracted with curbside clothing collection company Simple Recycling to launch a textile recycling program in February. The service is free to both the city and residents. “Simple is following the city’s recycling routes but is responsible for collections and customer service,” says Amanda Astor, community education specialist for Raleigh Solid Waste Services. 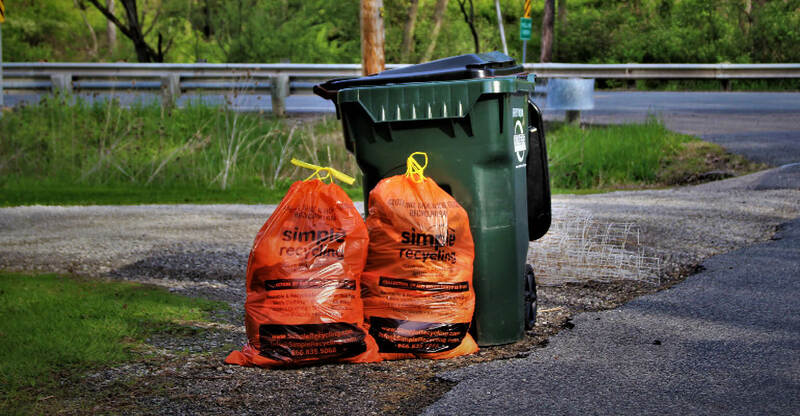 The company mailed orange collection bags to residents prior to the launch date, and picks them up on scheduled days, replacing full bags with new ones. Materials are sorted and resold to local thrift shops, exported to international markets or processed for raw materials if they’re unusable in their original form. In 2017, Oregon awarded seven grants to reuse/repair small businesses and nonprofits working with multiple materials—not just textiles. The funds will be used to bring on new staff and expand services. Two of the grants went to textiles-related businesses. But Oregon’s Department of Environmental Quality is trying to help local governments prevent textile waste before it happens through a public awareness campaign called Make Every Thread Count. Jurisdictions access ready-to-use and customizable educational materials. Among them are website and newsletter copy with tips to cut textile waste and infographics with compelling data, like making one t-shirt and one pair of jeans requires 1,500 gallons of water. Software company Curb My Clutter developed a platform whereby residents can text messages to schedule curbside clothes pickups, a service offered through city contracts. For now, the company does the pickups to demonstrate how it works, but it hopes to empower municipalities to leverage the software to take on collections. The curbside model will capture far more materials than alternative models, believes Bob Anderson, vice president of business development for Curb My Clutter. He cites Delaware as an example. Raleigh is waiting to see if its new program will pan out. “If Simple isn’t getting valuable/useable materials or if there is a high rate of contamination, that could hinder the success of the program,” says Astor. Meanwhile, Raleigh has invested in robust outreach, advertising the curbside program via its social media accounts and on its website. The Solid Waste Services Department has a webpage dedicated to it. Residents got mailers, and there’s been local TV coverage. Once materials are collected, there’s a need for regional high-tech sorting facilities to process more material faster and to sort for quality upfront and then by other characteristics like fiber type.